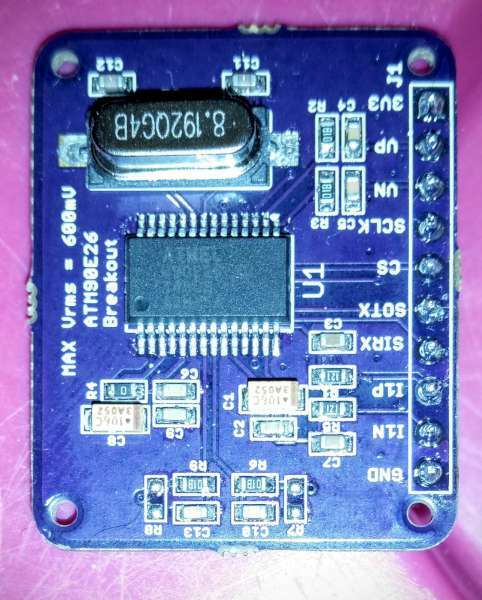 ATM90E26 breakout for AC energy monitoring. It allows development of code and applications conveniently. I wanted to test various energy monitor ASIC’s. I have already made an ADE7763 Breakout, I wanted to try the ATM90E26 for comparison and ease of use (SPI/UART alternatives). However it is not cheap since ATMEL’s version of the EVM is too expensive, aimed at the enterprise rather than electronics hobbyists. So I took the low voltage parts of the reference design and made a breadboard friendly breakout. Project info at Tisham Dhar’s blog. It’s also up on Tindie. This entry was posted on Thursday, May 19th, 2016 at 3:08 am	and is filed under builds. You can follow any responses to this entry through the RSS 2.0 feed. You can skip to the end and leave a response. Pinging is currently not allowed.